Call us at 817-485-2450 to make an appointment! Welcome to Davis Blvd Animal Clinic. Our clinic was first born in 1979, when Dr. Metcalf purchased the clinic from a former classmate, he then decided to expand and moved the clinic to our current location in 1982. Dr. Metcalf worked single handedly until 1986 when Dr. Peek came aboard and became part owner. Since then as the years went on Dr. Peek and Dr. Metcalf have always worked as a team to provide the best care for you and your pet. As technology and medicine change, our veterinary team is always learning and advancing the way we practice medicine. Please browse the rest of this site to learn more about us. Be sure to bookmark this page so you can find us quickly whenever you and your pet need our services. We look forward to adding your names to our long list of satisfied customers! 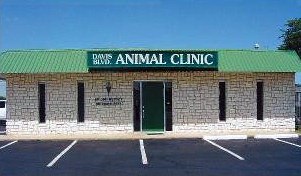 At Davis Blvd Animal Clinic , we treat your pets like the valued family members they are. We now offer the ability to order your heartworm and flea/tick medications online, also month to month heartworm medications. As well as all Science Diet, Purina, and Royal Canin foods. Please click the link below to view the options.